The people of Highland, Indiana welcomed the Rev. War Reenactment this past weekend with a ton a great questions and interested spectators. So to my fellow NWTA members, if you think Highland isn’t worth going to because it’s small…well, I think that’s depressing. I realize you could see me as biased. Our unit puts the Highland event on…but really, we just took the reigns a couple of years ago and kept most things the same. If anything, my heart belongs to the Forest Glen event in late September because that’s my father-in-law’s event (and it’s amazing). But Highland holds a very important place in the Midwest’s list of Revolutionary War Events, and if you’re a reenactor and you’re skipping it simply because you don’t think it’s good enough, shame on you. Why is Highland important? I guess that goes back to the question, why are we reenacting? Is it to educate the public? I’ve never had so many people come up to me and ask me genuinely interested questions. And I’m not the only one who felt that way about this past weekend. Our spectators really wanted to know about the Rev War, and it’s important they find out. With more and more changes in the government happening these days, a healthy reminder of where we came from and how our nation began can’t hurt. Is it to experience great, tactical battles? If you’re a reenactor and you haven’t visited Highland for a while, let me inform you that we did away with Fort Gazebo. If you’re not a reenactor, let me explain that we used to dress the pavilion at Main Square Park as a fort to defend…only we did it with a cheesy looking, heavy cloth painted to look like fort walls. So I can understand reenactors avoiding the event because they didn’t like that…except it’s gone now. That doesn’t mean we have awe inspiring, tactically challenging battles. We’d like to, but not enough reenactors show up. The battlefield isn’t any more or less impressive than Cantigny’s…it’s a big, open field. 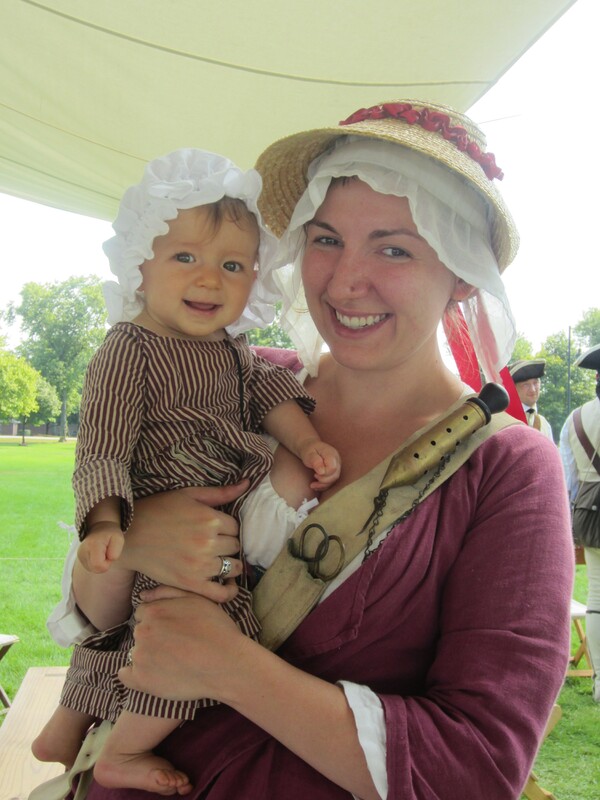 But plenty of reenactors show up at Cantigny…so why not Highland? We had, what, four British soldiers show up this past weekend? Where were the rest of you? Yes, I’m asking that! How can we represent the Revolutionary War to these interested suburbanites with four redcoats on the field? Is it to spend time with fellow reenactors? One of the great things about events like Highland is the less demanding schedule. I know Ginny and I had a great weekend spent between three different unit camps this past weekend because we had the time to do that. This was so nice, because we’ve got family all over the place out there. 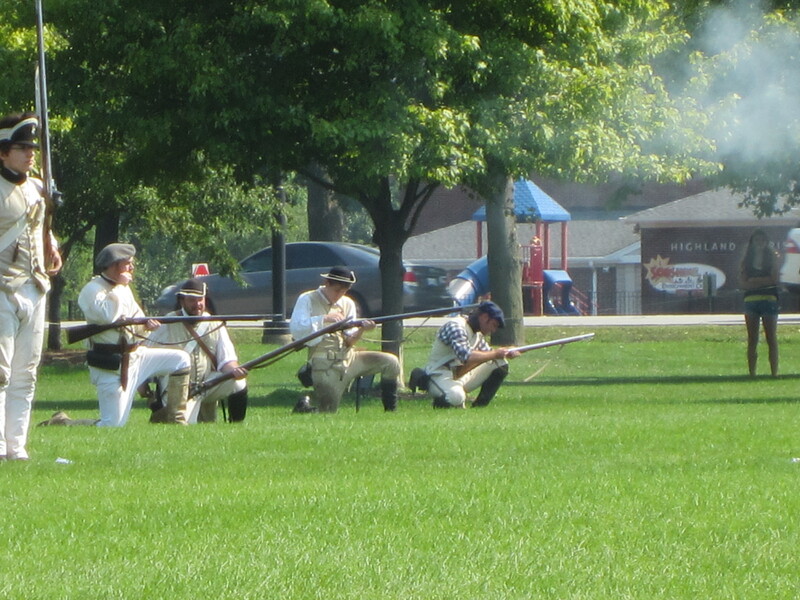 It’s difficult to really spend time with everyone at events like Vincennes, with two artillery demo’s a day. At less intense events, reenactors get to connect with each other because there’s more time spent in camp and less external attractions such as museums or shops. I didn’t always realize the benefits of this sort of scenario. In high school and college, I used to only show up at the big, high turnout events. But museums, monuments, and gardens take away from time spent with the public and with each other. With less external distractions, its easier to get to know people in other units. By the way, that’s a good thing! Is it to reenact to a large audience? Okay, I’ll agree that Highland doesn’t have a ton of spectators, but I really think a bigger reenactor turnout would fix this. There are so many awesome opportunities. There’s always a farmers market in the parking lot right next to the park. That’s a huge draw. As it is, shoppers usually come over to see what we’re doing. If we had a bigger presence, my guess is that those shoppers would call people and let them know about our event. Plus, the event site is right in town, and surrounded by churches. That might be a drawback to some, but I see this as an opportunity. They know we’re there! But they aren’t going to stop by if we don’t look good! The people that do stop by are interested, and I feel like we’re not giving them a good enough show. I genuinely feel like we owe it to that little boy who asked me about the difference between a wedge tent and wall tent to give him a good battle to watch. Right now, we’re doing the best that we can with the people who do show up. But I urge you, fellow NWTA reenactors, to show up at Highland next year if you can. The site is really supportive to our organization. We had plenty of firewood. There was plenty of food with the catered dinner. They provided coffee in the morning (with Truvia as a sweetener option!). The farmers market had a great cheese shop. And there weren’t any weird campfire restrictions. Sigh. Well, I apologize to my readers who frequently read my blog for weight loss tips and recipes. I realize this is a little off topic. I promise a couple of campfire recipes soon: one healthy, one not so much (for the Shawn and Kathleen test kitchen category). Reenacting is a passion of mine, as I’m sure you can see. Once again, if you are interested in reenacting in the Midwest, please contact me: kathleen@sweetpeasandsoybeans.com. I’ll be more than happy to help you get into this fantabulous hobby.